Today's integrated systems require both classical and numerical methods to predict end-performance reliably. 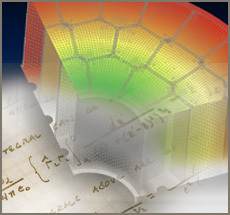 Hofstadter Analytical Services brings 30 years of success blending these approaches on sophisticated projects including spacecraft components, aircraft systems, ground-based equipment, and water borne sensor devices. At Hofstadter, we match our tools to the rigor your project demands: from "back of the envelope" analysis and consulting to full system modeling. By partnering with your engineering team throughout development, even before requirements are finalized, we regularly head off problems, saving design cycles and minimizing manufacturing or field costs. Click on any of the boxes below to see real world success stories.